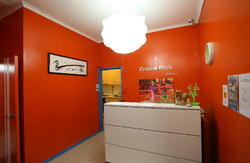 Strattons Hostel is located in the heart of the CBD and in Sydney's central 'backpacking hub'. Then come the bars, pubs, clubs, restaurants and funky cafe's! Escape the city for a day at the famous Bondi Beach by catching an express bus from just up the road. Once there you can chill on the beach or in a beach-side bar, and for the energetic travellers, the Bondi to Coogee walk showcases some amazing beaches, bays, reefs and big surf. There is really no better spot to stay during your time in Sydney. When you arrive home at Strattons Hostel you can take advantage of our own Backpacker Bar with amazing $3 drink specials all night every night. Lots to do, lots of fun, lots of travellers having a good ol' time! We have Wi-Fi, free luggage storage, a guest kitchen, free linen, an electronic key system, a bar and TV lounge, a tours desk and travel info, towel hire, and free use of hairdryers, irons and ironing boards. ***IMPORTANT*** CHECK IN IS AT WORLD SQUARE HOSTEL 640 GEORGE ST (corner George and Liverpool street above the Hungry Jacks). There is no reception on-site at Strattons Hostel. From Sydney Airport take an airport shuttle bus to the city and ask for World Square Hostel. The entrance is located next to Hungry Jacks on Liverpool Street (Corner of George). Or take the airport train to the city and get off at Museum Station. Then walk 200m down Liverpool Street and we are just on the right before you hit George Street.